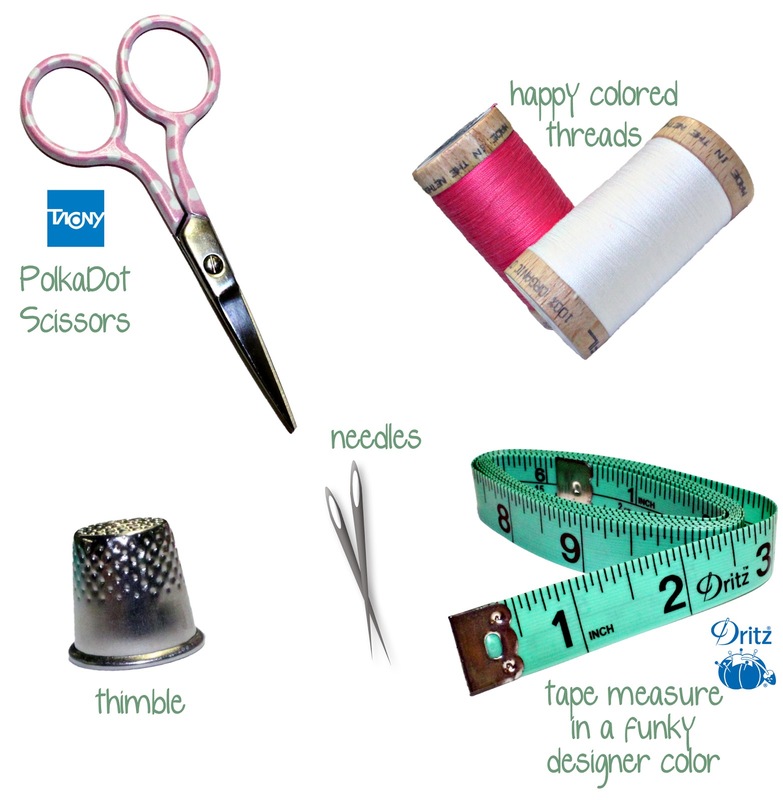 for your sweetest little sewing friends! 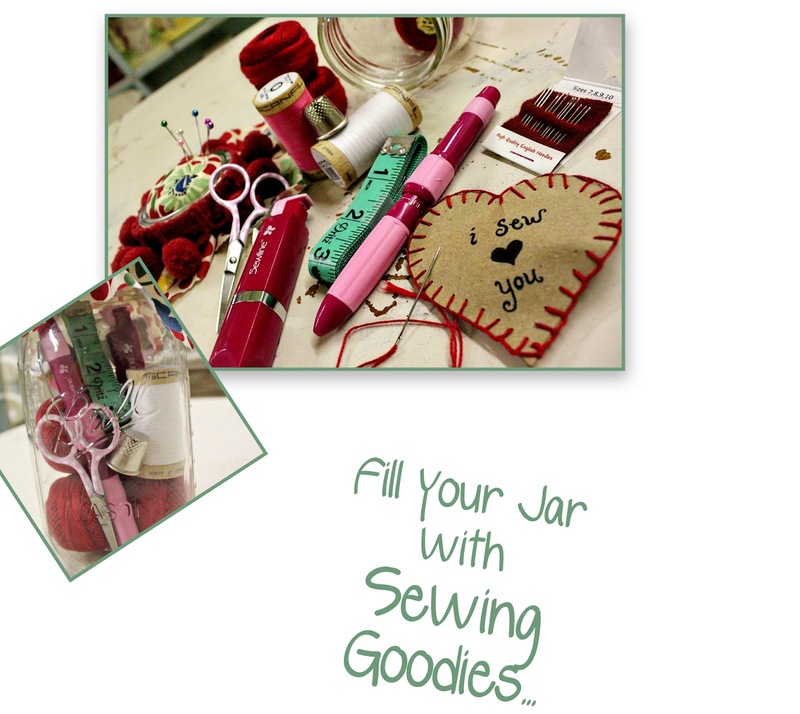 Gather up all of your favorite “necessity notions” and throw them all in a mason jar. To seal the deal, grab a cute piece of fabric & some batting and transform the top into a pincushion. 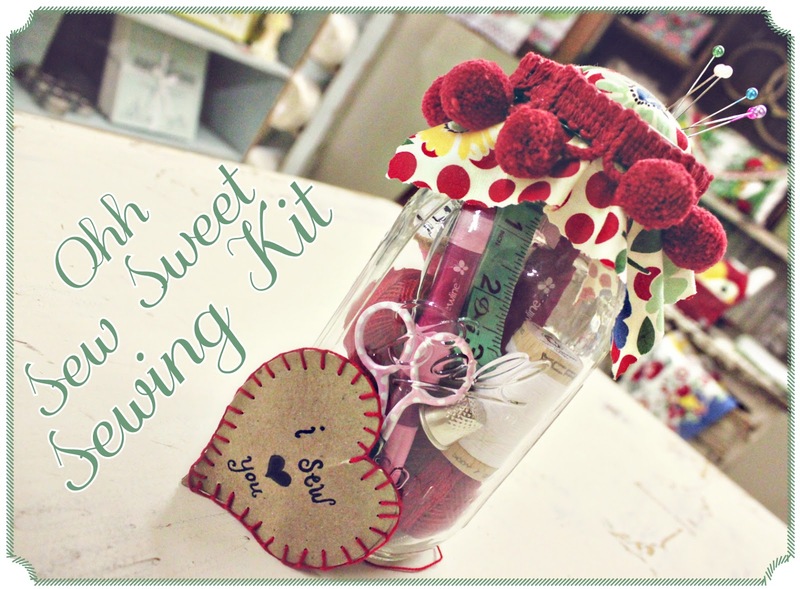 Sew Easy, Sew Cute & Sew Fun! Follow us & leave a comment describing the sweetest Valentine you ever received. Winner will be randomly selected on Valentine’s day. Los besitos que me dan mis niñas …. ¡ese es el mejor regalo del mundo! I follow on google reader and my favorite valentines are a bunch of dark red roses. Favorite Valentines Day was 1982 when I brought my first son home from the hospital! I follow this blog, and the sweetest gift, a handmade card from my husband years ago. I still have it somewhere. I follow your blog and sweetest gift a single red rose from my sweetie ! Thank you for the wonderful ideas on your blog! My sweetest gift was an original poem from a sweet man. It is now safely tucked away in the memory box…. one year my husband surprised me with plane tickets and a weekend getaway to chicago!! we had a great time.. I follow via blogger! Sweetest valentine ever was a poem my husband wrote while we were dating. I’m a follower of your blog. My sweetest Valentine’s memory was taking a trip with my hubby to see what is now our current home. I am a follower…the sweetest gift ever was a locket from my daughter engraved with the message “mom you are my hero”!! I follow the blog on Google Reader (and LOVE it!). My favorite Valentine was when my husband and I were dating and he gave me “honey bear” filled with sweet things. I’m a follower. The sweetest Valentine gift I ever received was a diamond ring wrap for my engagement ring from my sweet hubby. He bought it without my ring and just from memory matched it perfectly. Hmm…not much on Valentine’s Day here, but I think the sweetest was a hand made card from my nephew when he was 5 or 6. Can’t remember what it said, but it was cute! The sweetest Valentine gift I ever received was a little bear from my only grandchild (grandson)with a heart shaped card sending bunches of hugs and kisses. I just discovered your blog, and am now a follower. My favorite Valentine memory spans many years . . . at a very young age my third son rode his bike to the flower shop and returned with a beautiful carnation; the stem was broken from the ride, but it was oh so beautiful! I’m a follower. The sweetest Valentine I ever received was a beautiful card my daughter made me from a paper lacy doily. The sweetest valentine I rec’d was from my 6 month old son, left on his changing table, followed by one left from our dog in the dog food box–lovely surprises. My sweetest valentines are the many handmade cards and little gifts I have received from my kids and grandkids over the years. I still have them all. They are special treasures. The sweetest Valentine I ever received was from my brother. After a trying day teaching middle school (picture 2,000 young teenagers with hormones, flowers, and candy in one building) I retrieved my mail from the mailbox at home and opened an envelop from my brother, only to have several hundred tiny foil hearts tumbled upon my lap while I read the hand-written note, “Have I told you lately, that I love you?” All women should be so fortunate as to have a brother like mine. i’m not big on valentine’s day so it was a big surprise to have 3 dozen white roses waiting for me when i got to work. my husband snuck in before i got there, i just thought he went to work early. The sweetest was a mushy card from my husband. He took the time to find one he knew I’d love. I’m already a follower. A weekend at a B&B, was wonderful. I’m a follower. the Moda blog! Thlank for the chance to win!! I’m a follower. The best Valentine I ever received was a kitchen remodel. I follow your blog! The sweetest Valentine’s Day surprise I ever got was when my husband made a treasure hunt for me! I was so touched that he spent so much time on such a fun thing! I am a follower. Its hard to pick one Valentine, as it is also my birthday, but when we were dating, my hubby gave me a huge bear with amethyst earrings for me on the ears! I’m a follower and although not just for me, a darling godson born on Valentines Day! i’m a follower 🙂 the sweetest valentine … a potted mini tea rose i was able to keep for years. This is so cute! I am already a loyal follower! This is cute. I am already a follower. Best gifts–anything homemade by my boys! The sweetest valentine I ever had was the last one I spent with my Mom. She was healthy and good. Just how I love to remember her. The sweetest Valentine I’ve ever gotten was from my husband. He got me a huge purple bear from the Vermont Bear company knowing my favorite color is purple. I thought that was the gift but, the bear was wearing a purse and it wasn’t for at least an hour before I was looking at the purse and thought to look inside. In there I found a gorgeous diamond necklace. The most memorable for me is the first homemade Valentine card my son made for me in preschool. He was so proud of all that glitter! His face was priceless. Definitely a handmade card from my daughter where she proudly proclaimed, “Mom, You’re the Beast!” I framed it. She’s 18 now! How sweet! thanks! have a great weekend! What a sweet valentine treat! Very clever idea and it would be enjoyed by anyone who quilts! Absolutely adorable! Love your idea! My sweetest valentines was my first with my husband! I follow already and my best valentine was a bed and breakfast surprise!! The best Valentines are homemade ones, esp. by a child! Sweet little valentines from the sweetest little faces in my house! Lovely giveaway! My best valentine was the first one with my hubby! Love that jar of goodies! This is soooo cute!!! The sweetest Valentine’s gift I got was a large gift bag filled to the brim with a variety of chocolates last year from my husband. We were away from home during Valentine’s (our destination wedding)and it was waiting for me with the sweetest card inside. The kit is so cute and very useful! I guess the sweetest valentine I ever received was my engagement ring in 1971!! We’ve been married for over 40 years. I am a follower. My husband put a huge banner along the side of my apartment building on Valentines day. It must have been at least 20 feet long! The sweetest gift I ever got was a sweatshirt with my son’s hand prints on it.I follow you in Google reader. I follow you 🙂 Google?? Anyways! The sweetest Valentine gift I received was having all my boys and husband home for a special dinner. Holidays are for family time! The sweetest Valentines are the homemade cards given with kisses from my 3 children. What an Excellent Idea! These would make great birthday and christmas presents! And store giveaways in our quilt shops! I am a follower – the sweetest valentine I have ever received is when my boyfriend sent a folk singer to my aerobics class to sing me a love song. The SWEETEST Valentine’s gift I ever received was in 1995, on Valentine’s Day when I accepted the Free Gift of Salvation from Jesus Christ. THAT was a gift of love! I am already a follower. Sweetest ever was the heart shaped red plaster with my daughter’s hand print in it. I am a follower via email. LOVE your posts… and love the opportunity to win something super awesome. 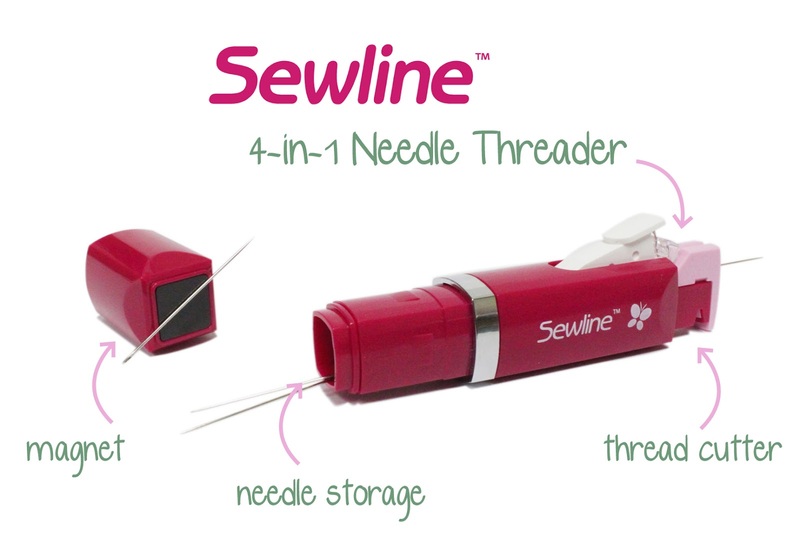 That little pencil and needle threader are great! My favorite Valentines gift was the DVD my daughter made my husband and I of our family growing older – through 4 generations. I can’t watch it without shedding a few tears. Be blessed! Beautifully fragrant bouquet of flowers from a very special love. P.S. I follow you everywhere–newsletter, blog, facebook–for a very long time! My G-babies made me a Valentine card last year and I’m hoping to receive another one this year!! Sweetest Valentine I ever received was the engraved gold heart locket from my hubby the year we got married. I’m a follower. 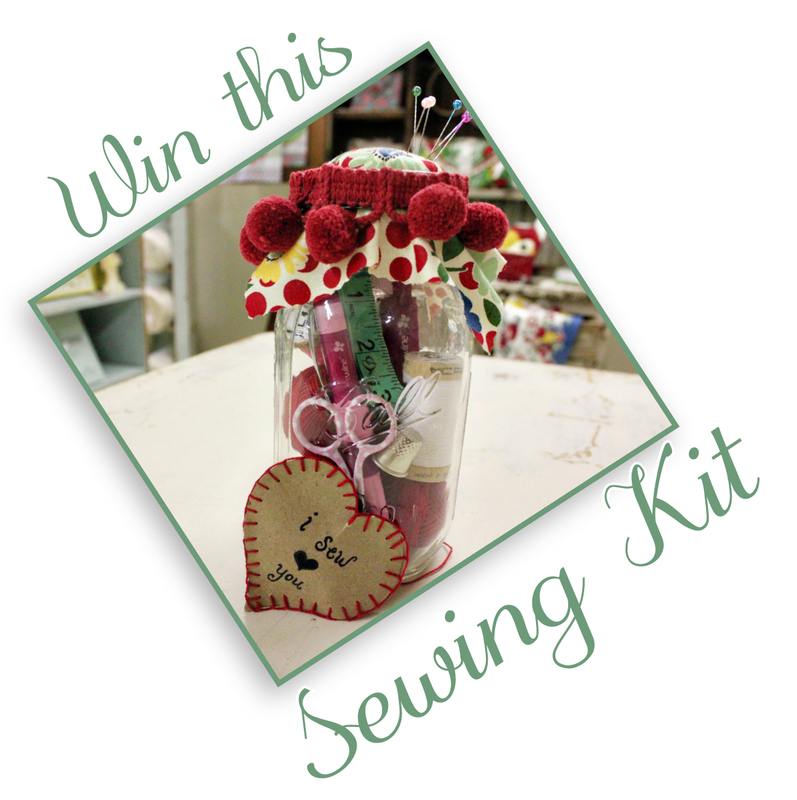 Thanks for the chance to win that adorable sewing kit. I got a flower arrangement from the Mr. that he created himself. Not perfect in execution but perfect to me! I would have to say anything handmade from a child is sweet. I enjoy getting gifts from children. Thanks for the chance to win! My sweetest V-gift was this year. I received a note from my overseas adult son asking me to be his Valentine. Is that sweet or what? The best valentine I have received was a teddy holding a red heart to add to my bear collection. I am a follower via Google reader. My nephew and also my God Child was born on Valentines Day. He has now had a child of his own, so the gift just keeps giving!! as always, i love homemade cards from my kids. The sweetest valentine I ever received is one my grandson made for me last year. He was 5 and made it himself, with some help from Mommy with the spelling. I’m following you. My sweetest valentine is anything that has chocolate in it. I follow your blog. The sweetest valentines are the homemade ones from my daughter. Already a follower. The sweetest valentine is any expression of love ……with grand-daughter hugs being right up there on the top of the list. I’m already a follower…my best valentine’s are the cards I have received from my family. I follow your site. My fav Valentine day is just spending time with my hubby. I follow your blog…love all the ideas! Best valentine was a stand up mixer from my husband when we were in college. I follow your blog! Not a huge fan of valentines day. But the sweetest gifts are the ones my kids made me when they were young. I follow via email. cute giveaway. I love anything that has to do with birds and my husband bought me a tiny little bird figurine. I am already a follower. 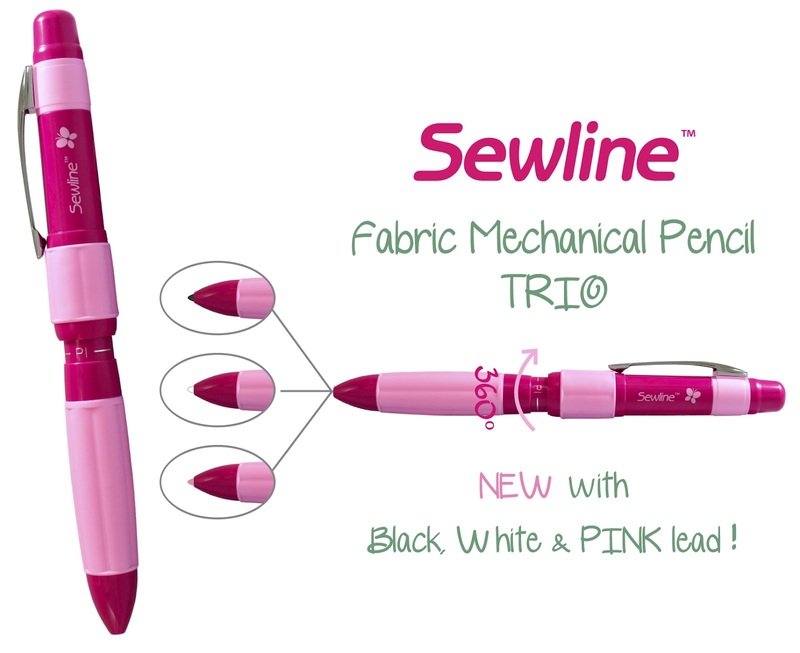 But you had me at Sewline! Thanks for the cute idea for a great gift. I forgot to say my sweetest valentine–that was always the cut and paste treasures my three kids made at school and still melt my heart when I come across them in the archives of my desk drawers! I am a faithful follower of your blog and check out the Bake Shop everyday for something new. I love chocolate and just the other day my husband surprised me with a tin of chocolate truffles. Yummy!! I have been a follower on Blogger. My favorite Valentine memory, was when my husband and I were first engaged, and it was our first Valentine’s Day. He did the roses and a special card. We’ve been married over 34 years now! Too cool! I’d low to use a kit like this for many purposes, and it would even be. A good kit to send off with my son when he moves out on his own! What a great blog! Thank you for the opportunity! My mothers birthday is on Valentines Day! We always have a lovely time! My favorite Valentine’s are the funny cards my husband gets me – they always make me laugh so hard! My favorite Valentine was a pasta necklace from the grandson. So cute! Follow on facebook. Thank you for the chance to win.